Depending on the size of your organization and the nature of its business, a hosted spam filter may be the most suitable solution to prevent spam, phishing emails, spoofed emails and email-driven cyberattacks. A hosted spam filter is a filtering solution hosted in the cloud. Like other cloud-based applications, a hosted spam filter does not incur capital expense, is infinitely scalable and can be managed from any Internet-connected device. In addition to these advantages, the software driving a hosted spam filter is updated by the company providing the hosting. This not only saves the disruption of site visits and downtime to update virtual and physical appliances, but also ensures that the spam filtering solution is identifying and quarantining the latest web-borne threats. Spam cost industry billions of dollars each year. Industry experts suggest it takes an average employee four seconds to identify and delete each spam email. For an organization employing 1,000 staff – each receiving just five spam emails each day – this means that it will lose 219 days of productivity each year due to spam email. A potentially bigger cost to industry comes from the volume of phishing emails, spoofed emails and email-driven cyberattacks that evade detection. Although organizations are strengthening their security defenses with employee online awareness training, statistically it is only a question of time before an employee innocently clicks on a sophisticated spoofed email and infects the organization´s entire network. A report produced by the Ponemon Institute in 2015 – “The Cost of Phishing and Value of Employee Training” – concluded that the average cost of repairing the damage caused by a successful cyberattack was $1.8 million. That figure failed to include regulatory fines. By comparison, the cost of protecting your organization with a hosted spam filter is around $10.00 per employee per year. Hosted spam filter solutions work in exactly the same way as virtual and physical appliances. Inbound emails are inspected against lists of senders and their IP addresses to identify those known to have originated from untrustworthy sources. The multi-layered security mechanisms also check for breaches of sender policy frameworks to detect phishing emails and spoofed emails. Any emails rejected by the filter are quarantined – as are any emails found to have infected attachments or links to compromised websites by anti-virus software. The solution also checks that outbound emails do not contain spam or viruses in order to prevent the organization´s outgoing email servers from being blacklisted by global blacklisting services. The primary distinctions between a hosted spam filter and other email filtering solutions is that the security mechanisms are always up-to-date, and its cloud-based hosting makes the service simple to implement and manage. Organizations simply have to adjust their mail exchanger (MX) records in order to redirect inbound and outbound traffic to the service provider´s email servers and then manage the solution via a web-based portal. Will the filter reduce the load on my email server? Is there a choice of options for what happens to the spam emails? What anti-virus software is used by the hosted spam filter? What front-line tests does the filter conduct? Is there more than one cloud-based hosting option? Thereafter, the best hosted spam filter will likely be determined by an organization´s individual situation. If yours is a smaller organization with limited IT resources, a low maintenance overhead may be a consideration. With a cloud based solution no software or hardware investment or maintenance is required. SpamTitan Cloud is a professional spam filtering solution for business. As verified by the leading testing and certification authority – VB Bulletin – SpamTitan blocks 99.97% of unwanted and malicious emails. Due to the solution being hosted in the cloud, emails are filtered and checked for viruses before reaching an organization´s mail server – substantially reducing the load even if the organization opts to have spam email above a certain score tagged and delivered. Double anti-virus protection is provided by the top-rated Bitdefender and Clam Anti-Virus, while front-line tests such as RBL (Realtime Blackhole Lists), SPF (Sender Policy Framework), Recipient Verification, Greylisting and SMTP Controls prevent delays in the delivery of incoming emails. SpamTitan Cloud can be hosted in our own cloud, but the options exists for larger organizations and MSPs to have the solution hosted in a private cloud or within their own infrastructure. Due to the advantages that SpamTitan Cloud has over virtual and physical appliances, our hosted spam filter provides protection against unwanted and malicious emails for more than 5,000 customers in more than 120 countries. Many of our customers have been kind enough to write verifiable testimonials about their experience with SpamTitan Cloud. Copies of the testimonials are available on request. We believe that the best way to evaluate any spam filtering solution is to test it in your own environment. In this respect, we invite you to test the advantages of a fully-enabled SpamTitan Cloud hosted spam filter for free for thirty days. The offer comes with full technical and customer support and with no obligation on you to purchase a license once your trial period has ended. 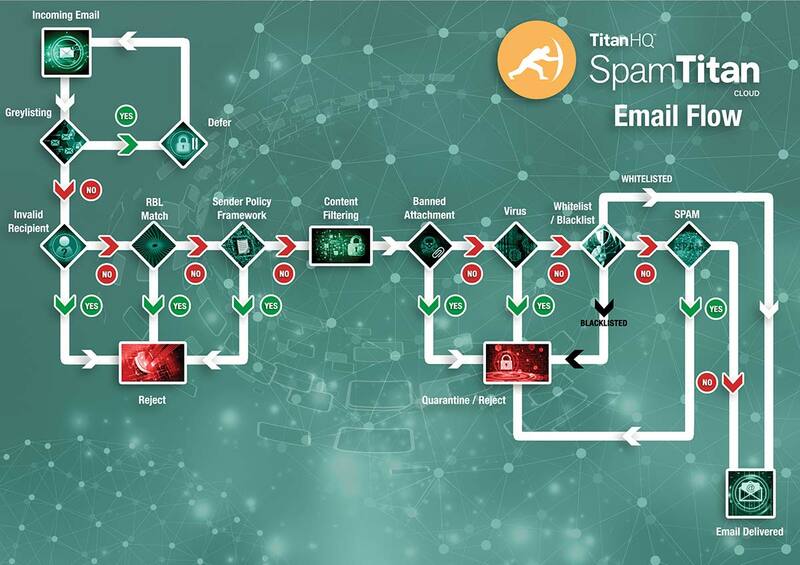 Implementing SpamTitan for your free trial is easy. Simply call our Customer Support team and one of our sales technicians will guide you through the process of redirecting your mail exchanger record and creating an online account in order to manage the solution from any Internet-connected device. Within minutes you will be filtering your inbound and outbound emails to prevent spam, phishing emails, spoofed emails and email-driven cyberattacks.